On Saturday, 21st April, 2018, the 8th day fidau and final burial ceremony of late Otunba Mrs. Adebola Osikoya was held at 3, Bees Event Centre, in Ketu, Lagos. It was a well-attended event as about 2,000 guests turned up. A lot of Very Important People (VIP)s from Ijebu stormed the event. This is because Otunba Adebola Osikoya and her husband are prominent Ijebu citizens. She died at 84. Her husband turned 90 late last year. Both loved themselves dearly. Till she died on Saturday 14th April, they were each other friends. She was buried on Sunday 15th April in Ijebu-Ode. After a service at the Central Mosque in Ijebu-Ode conducted by the Chief Imam of Ijebu-Ode Central Mosque, she was buried at Ijebu Muslim Private cemetery on Lagos-Ibadan way. Before her death, she had left words that she be buried in Ijebu-Ode. The 8th-day fidau was held on Saturday 21st April, 2018. Below City People’s KEMI IGBALAYE brings you gists from the grand event. Late Otunba Adebola Osikoya is from the Alatishe family in Ososa, she attended Queens College, Lagos and Annie Walsh School Sierra Leone for her secondary education. She read Radiography in the United Kingdom and practiced for over 50 years. She owned the Ikeja Xray Clinic which she had till she died. Mama Osikoya was women member of Ilupeju Women Association (I.W.A) also Annie Walsh Old Student Association, Nigeria branch. 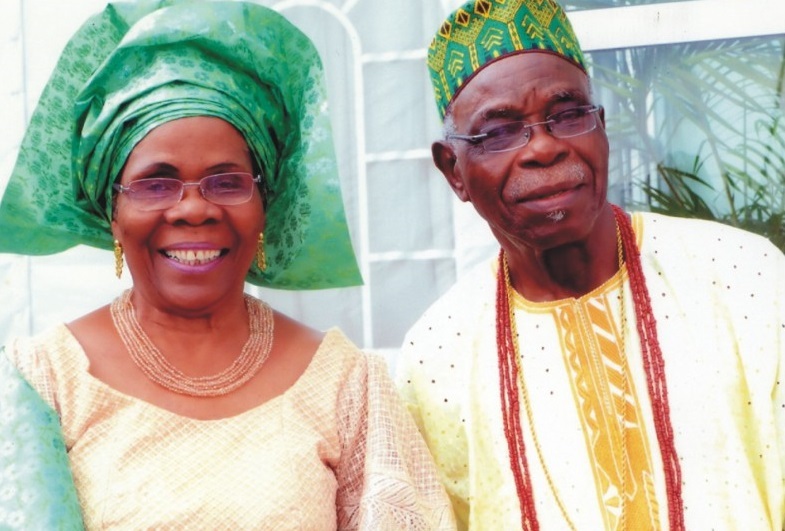 Late Mama Osikoya is survived by her loving husband Otunba F.I. Osikoya who recently turned 90 and children. Mama inher lifetime was a staunch Muslim. Mama left very many successful children. They are Otunba Ade Osikoya, Engr. Kehinde Osikoya, a Road Construction Engineer, Mrs. Bukola Fadayomi, an Educationist, Engr. Tosin Osikoya and Mrs. Busola Akinubi. She was survived by a lot of grand children and great grand children. “Late Otunba Adebola was very hardworking and brilliant in her lifetime. We went to same school at Queens College, Lagos. She is a year senior but she is a good friend. We have been friends since 1949”. (Mrs. Nancy Kolade nee William). “Adebola was my friend we went to same school Queens College, Lagos. It was a boarding school then. She is very brilliant, understanding and also accommodating” (Mrs. Margaret Eradajaye). The event was well attended by very many celebrities like former Ogun Governor, Otunba Gbenga Daniel, Otunba Biodun Onanuga. Some traditional rulers came like HRM Oba Dr. Isiaka Akintunde Adio Balogun Oyero (Ilufemiloye 1), the Oba of Ketu Kosofe Lagos and his lovely Olori, Evang. Dr. Deborah Modupe Balogun. Also in attendance was Chief Idris Jinadu (the Asoju Oba of Ketu) and Chief Olugbenga Ajayi (the Onibode of Ketu). Akinrogun Tunde Odanye, Otunba Seyi Oduntan and Akogun Seyi Onadipe were also at the event. Oba of Ososa, Gbegande. So many Caterers were present like T & K Catering Services, owned by Alhaja Iyabo Shitta, Da Chillaz, Jollof Plus Catering Services, Wonabi Catering Services, Tiffemy Concepts, Sean B Foods, Offers Catering Services and so many others, TYKS Caterers. The musician, Harmony Blender Music was also there playing so many highlife music and entertaining the guest. Mama is from the Alatishe Royal Family. She was the Olori-Ebi till she passed on. Very visible at the event was her siblings from her father sie like Mrs. Hairat Aderinsola Balogun, a legal luminary and former Attorney General of Lagos State. There is also the Gbegande of Ososa, Oba PAMA who is her blood brother. There is also Chief Gboyega Alatishe, Mrs. Sola Okunowo, a leading caterer who owns TYKS Caterers and Demola Alatishe. Late Otunba (Mrs.) Osikoya comes from the Alatishe family. Mama’s mummy was the 1st wife of Alhaji Jinadu Alaba Alatishe.